The debut novel from the creator of Thuglit. Boo Malone lost everything when he was sent to St. Gabriel's Home for Boys. There, he picked up a few key survival skills; a wee bit of an anger management problem; and his best friend for life, Junior. Now adults, Boo and Junior have a combined weight of 470 pounds (mostly Boo's), about ten grand in tattoos (mostly Junior's), and a talent for wisecracking banter. Together, they provide security for The Cellar, a Boston nightclub where the bartender Audrey doles out hugs and scoldings for her favorite misfits, and the night porter, Luke, expects them to watch their language. At last Boo has found a family. But when Boo and Junior are hired to find Cassandra, a well-to-do runaway slumming among the authority-shy street kids, Boo sees in the girl his own long-lost younger sister. And as the case deepens with evidence that Cassie is being sexually exploited, Boo's blind desire for justice begins to push his surrogate family's loyalty to the breaking point. Cassie's life depends on Boo's determination to see the case through, but that same determination just might finally drive him and Junior apart. What's looking like an easy payday is turning into a hard bounce--for everyone. Todd Robinson is the creator and chief editor of the award-winning crime fiction magazine Thuglit. His short fiction has appeared in Blood & Tacos; Plots with Guns; Needle Magazine; Shotgun Honey; Strange, Weird, and Wonderful Magazine; Out of the Gutter; Pulp Pusher; Grift; Demolition Magazine; and CrimeFactory. 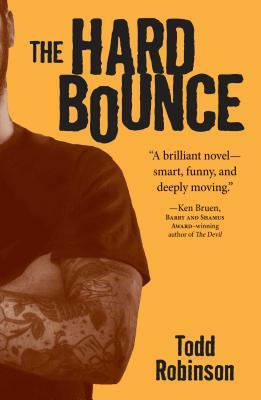 His writing has been nominated for a Derringer Award, short-listed for Best American Mystery Stories, selected for Writer’s Digest’s Year’s Best Writing 2003, and won the inaugural Bullet Award in June 2011. "Robinson...weave[s] it all together...skillfully, dare I say this artfully? Dude is a talent, and I for one can't wait for the return of Boo and Junior." --Grift Magazine, "Favorite Books of 2013"